Do you remember after my first Giveaway finished, I promised you that there would be another Giveaway soon? Well, I guess, I keep my promises, LoL. 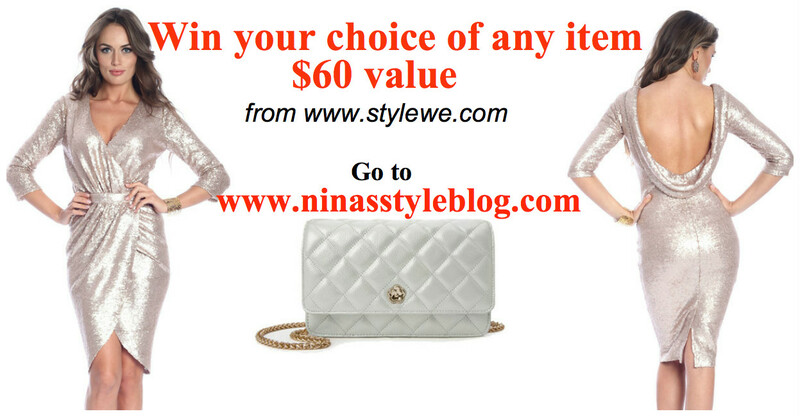 Today, I'm very excited to announce another, amazing Giveaway on Nina's Style Blog. I've partnered with www.stylewe.com to give you an opportunity to win your choice of any item on www.stylewe.com, up to $60 value. I have already talked about this online store in one of my previous posts but if you missed it, I will tell you __ this is an amazing online destination of many fashionistas, where you can find pretty much everything you may need for your wardrobe. You can check out their Instagram www.instagram.com/stylewe/ and Facebook Pages www.facebook.com/stylewe/ for more inspiration. * Open to the residents of USA, UK, Canada, France, Italy, Germany, Australia. * The giveaway ends on Thursday, December 23, 2016 at 12:00AM EST (eastern Time). * The winner will be notified via the email she/he used to enter the Giveaway. After 48 hours, if there is no response, another winner will be chosen. Congratulation Dawn N. , you are the random winner of this giveaway. Thank you everyone who participated and remember, there are more giveaways to come in 2017, so stay tuned. This is a great giveaway, girl! I've heard of this store, but have never purchased anything from them before, they seem to have cute, trendy pieces! Thanks for sharing and I hope you're having a great week so far! Oooh, love the black and white jumper! Awesome giveaway! The have such a cool stuff! I love that middle sweater! So cute! Loved this giveaway, it's so nice t have one close to Christmas, to have the chance to win a nice present! Well done! Hope you have a very nice day! Love this giveaway! Great pieces. Great giveaway! Love these pieces! What a wonderful giveaway! I love your picks Nina! This is such a great giveaway! I love that white sweater with the black chevron design! Sad to be located in Mexico. Great giveaway! Great giveaway! Thanks so much for sharing! I would love to enter but unfortunately, I don't reside in any of those countries. What a great giveaway. That red dress is so pretty. such a fun giveaway! very cool! Such a great give away. That would definitely be put to great use by the winner. Have a great week. Such cute picks! Love the lace up sweater! Yay! Luv a giveaway and stylewe! The jumper in the middle on the last row of pictures is beautiful! A great giveaway, Nina! Love this giveaway, thank girlie!! Those all look like great pieces! I'm especially loving the black and white sweater, so cozy. Such an awesome giveaway! Woot! What a perfect giveaway babe! And just in time for Christmas too! That sweater is gorgeous! Love this giveaway! I love the white and black stitch sweater. So cute with plaid pants! I love Stylewe! So many amazing finds! Thanks so very much for the chance to win!!! I'm so excited 😊!!! I have never been so happy to win something!!! This was such an amazing giveaway. Congrats to the winner!